Nursery School Kids have an amazing day out! 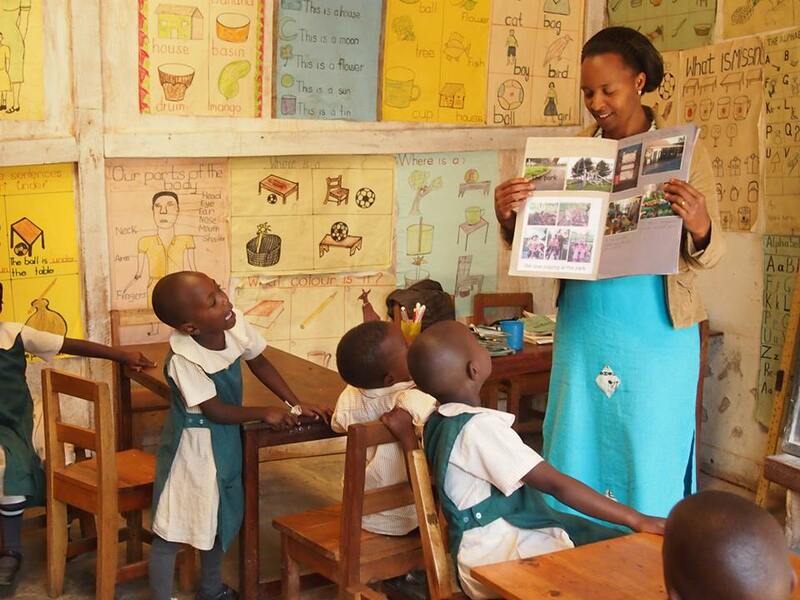 On March 14th our nursery school at Bufuka hosted the Life Academy Nursery School from Ntungamo – one of the nurseries in our Circle of Friends. Paul the founder of Life Academy has sent us this letter which eloquently expresses their experiences of the day. Our time in Kabale at Bufuka was superb!! Time Check- Thursday Thirteenth around mid day, the taxi operators inform us, they could only carry 14 kids each!! Total would be 28 kids yet we had thought all along we would take 40 kids!! 2pm, 13th- The local vicar agrees to call up the head teacher of Kabale secondary school to allow us use their bus for 400,000 shillings!! 15 minutes later, he calls back to say we would have the bus. By then our kids have already been informed and are preparing for the trip excitedly. Parents are calling at school unexpectedly to confirm the news their young ones would be traveling to Kabale on an all expenses paid trip!! Most have never been to Kabale before and there is sweet suprise in their eyes when I answer the question in the affirmative!! By 7am Friday 14, 2014 the kids start arriving at school in their smart beautiful African print Uniforms!! The whole school is bursting at the seams with excitement!! By 9am, the bus arrives!! None of our kids had ever been on a bus before!! They are all excited at this moment and clapping uncontrollably!! Tears are welling up in my eyes that these kids are getting an opportunity I never had as a child. I am thinking to myself, Edirisa has made my dream come to pass!! Shortly after 9am, the bus sets off through the local trading centre- Kyemepene. All the traders are out of their shops to catch a glimpse of young nursery children on a bus traveling to Kabale. It is unbelievable. We stop briefly and people are flocking the bus windows to confirm this was real!! Yes it was. THANK YOU EDIRISA. Afew moments later we are out of the trading centre!! The kids are screaming their lungs out!! They were shocked to see trees “run” past the bus in the opposite direction. Soon some people start “running past” the bus in the opposite direction and the kids are extremely excited about all this. Jubilation and singing fill up the air. I instruct the 2 nursery teachers we were traveling with not to stop the kids from enjoying their moment!! We soon arrive at a Tarmac road in Rubare Trading centre. All our kids had never seen a road made on Bitumen and rocks. We stop for them to take in the moment!! You should have been there to see the amazement!! Fast forward, we are in at lake Bunyonyi. My phone is ringing off the hook as Phionah from Edirisa tries to make sure we are safe and ok!! We finally arrive at Bufuka!! The view of lake Bunyonyi captivates the kids!! One of the kids on the trip Richard, gets scared of the water body and decides not to exit the bus!! ha ha ha. It took good convincing to have him get out and join other kids for a delicious cup of porridge prepared by EDIRISA. Shortly after, our kids join Bufuka kids in their respective classes! The classes are something our teachers had never seen before. The system of teaching, very different from ours!! As teachers at Bufuka sat in a circle teaching, our teachers fidgeted looking for a chair to sit!! The Bufuka teachers were above their game!! We were totally blown away!! One it was all different for our kids and teachers, two EDIRISA had decided to give us an opportunity of a life time sponsoring the trip and allowing us ful l access to the work they do at Bufuka!! Quite humbling!! After class, we went for sports activities. Football was one of the games plus several others!! Life Community Academy kids won one of the events just before lunch time!! Lunch was another big one for our children. Less than five in 40 had ever drunk a bottle of soda!! They are still talking about it until now!! It is what every parent says the children still talk about at their homes!! Then the lake trip!! I was personally scared too…..except I made it safely across. The kids could not believe what they saw and experienced. They went singing on the boat, from Bufuka shore Past Nature’s Prime Island, past the various camp sites and hotels on the lake shores!! Amazing, Amazing, Amazing!!!!! 7 of our kids refused to do the boat ride!! The mass of water was simply overwhelming!! Around 5.30pm, the curtain came down on our adventurous and very educative trip. Every child of nursery going age, in my village should surely experience what we experienced!! It is still the biggest news. Never closed their eyes on the bus to sleep as we had anticipated. They were all very excited and wanted to see everything they had to see and saw could not bat an eyelid and miss out on anything. By 8pm, we were back at school with very happy parents waiting to walk their kids back home. The children at Bufuka benefited from the day as well and we hope to host more children from our partner nurseries in the future. The doctors and medics from the University of Slovenia Tropical Medical School have been working hard at our clinic on Bwama Island and in addition are also running small outreach clinics and health workshops in the community. Last week they visited The Full Gospel Church in Kabale. The Church run a street children rehabilitation program in partnership with Koinonia ministries.They have 15 children who live at the church full-time and 10 or more who come during the day. The day the doctors arrived there were a total of 27 children and they were taught about how to prevent diseases by practicing good hygiene, dental hygiene, nutrition, and HIV prevention. All the children were medically examined and treated where necessary, they had their teeth examined and 6 children had teeth extracted. Everyone was given a tooth-brush and toothpaste and the project was giving de worming tablets for the children. The doctors will be returning to do HIV testing next week. Thanks to our Operations Manager, George, for organising this workshop and special thanks to the doctors. Welcome to our first blog post of 2014! 2013 was a busy year and we are grateful to all our supporters for their generosity, to our staff in Uganda for their hard work and commitment and to the volunteers who have brought enthusiasm, ideas and energy and have undertaken a variety of tasks with relish. Throughout the year we ran sewing workshops with the craftwomen’s groups in Bukinda and Rubona thanks to a grant from the Give a Hand Foundation. 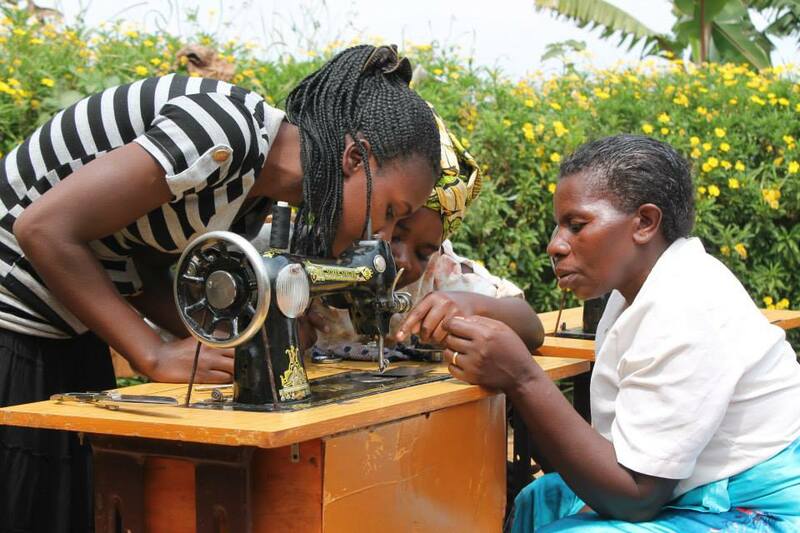 The women learnt how sew and were taught useful skills for maintaining and fixing their sewing machines. 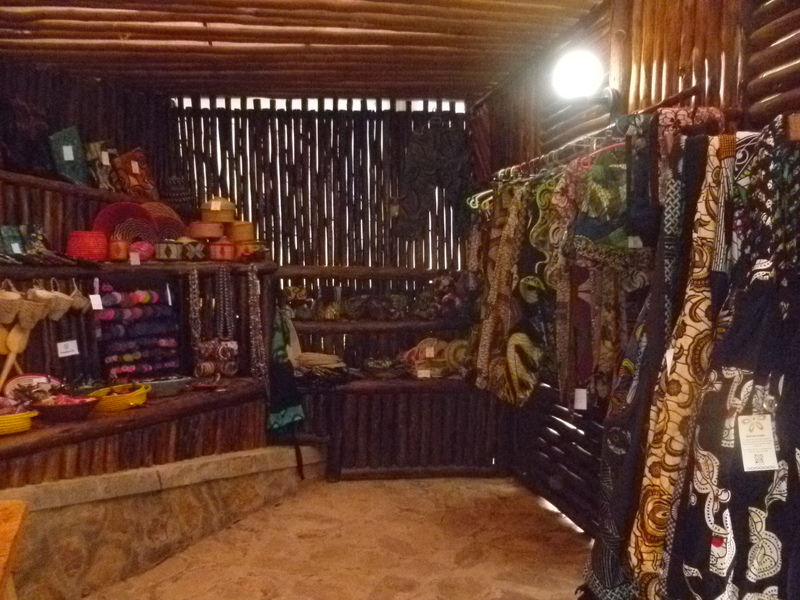 For many years now we have run our own craft shop at the Bunyonyi Overland Resort. It’s been steadily growing in popularity and recently outgrew it’s kiosk! 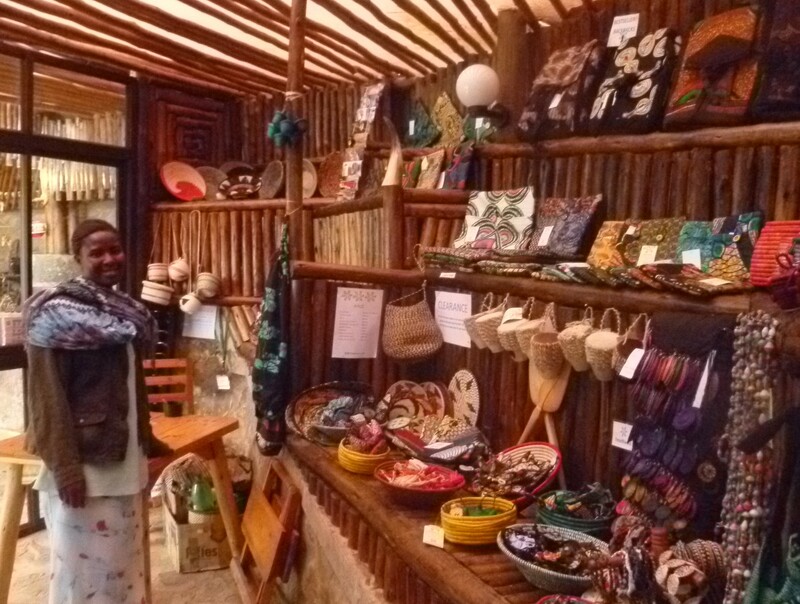 Consequently, a new shop was built giving us much more room to display the beautiful products being made locally by the women in our craft groups. We also opened a brand new craft shop at the Lakeview Coffee House at Kachwekano which we are extremely pleased and excited about. During the year our nursery school children enjoyed a variety of creative activities. They also received communication, in the form of scrap books, from their partner nurseries around the world who take part in our Circle of Friends programme, an initiative that is steadily growing. Our Circle of Friends links nurseries around the world to promote creativity and friendship through the sharing of information, cultures, ideas and friendship. The children were also lucky enough to receive a shipment of story books from the charity Pelican Post who deliver books to disadvantaged children all over the world. The nursery children certainly enjoyed hearing the stories and looking at the colourful pictures. Not to be left out, the teachers also participated in two nursery workshops organised by Alma Burciaga who was our Operations Manager up to September. She did a great job, ably supported by our Nursery Co-Ordinator, Ashaba Phionah. Teachers from our own 4 nursery schools were joined by teachers from the other 5 Ugandan nursery schools that are members of our Circle of Friends, it was a great opportunity for them to meet, share ideas and learn more about child centred methods of education. Alma left us to return to Mexico and we wish her all the best for the future. The clinic on Bwama Island has been busy all year and the Slovenian Doctors have worked extremely hard getting everything organised. 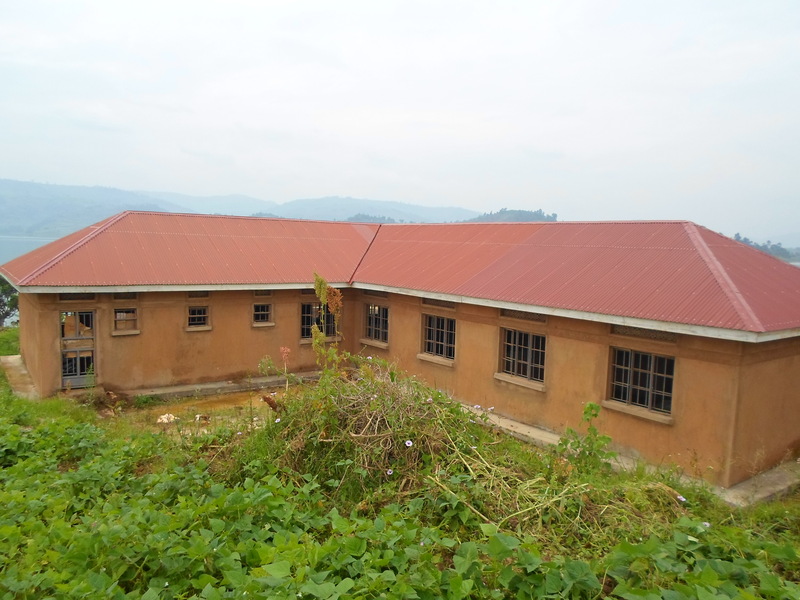 The maternity and overnight ward is almost finished and soon we will start constructing the new latrines and showers. 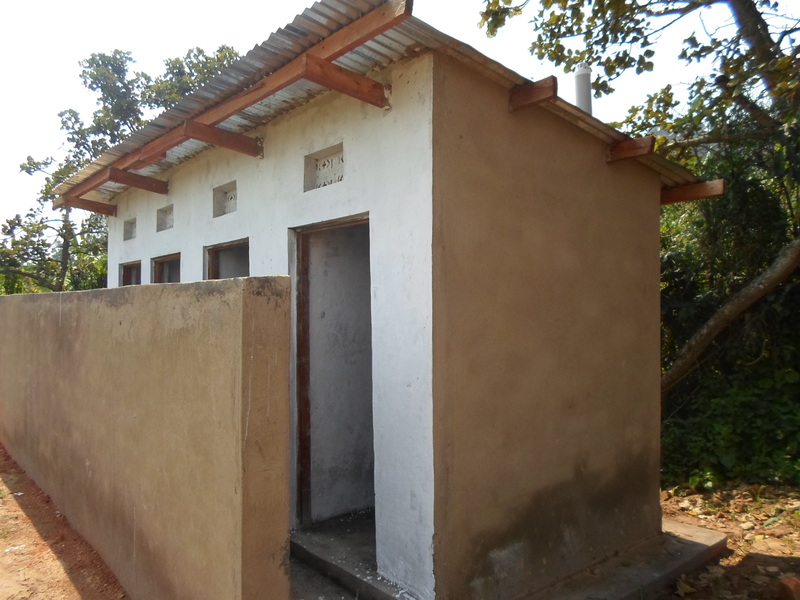 At Nyakasiru with a grant from Kitchen Table Charities Trust we have built a new 4 stance latrine at the primary school together with a new water tank – they are not quite finished yet but will be before the new term starts. In August we welcomed a new Operations Manager. 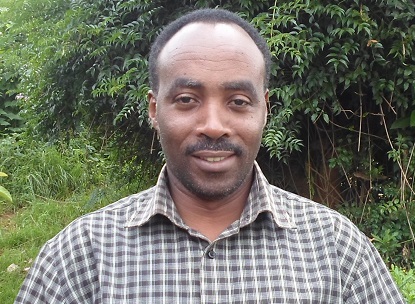 This is George Kakonge, he is married with 2 daughters and we hope he will enjoy working with us. In September we said goodbye to Kirsty, our Crafts Development Manager who spent a hugely successful year with Edirisa UK, and in her place we welcomed Antonia who joined us in December from England. Antonia will be assisted by Sheryl, who comes to Uganda from Australia with her seven year old daughter. We wish Kirsty well and hope our new arrivals Antonia and Sheryl enjoy their time with Edirisa UK. THAT’S just a few of the things we’ve been up to this year. Christmas was celebrated with a lunch at the Lakeview Coffee House attended by 48 people – Edirisa UK’s 36 local staff, the District Education Officer, 2 of our local priests and other local partners. SFP GROUP set the teams a number of ridiculous challenges to raise money for various charities with the UnTOUCHables supporting Edirisa UK. SFP Group is made up of six entities, Touch Financial, SFP Recoveries, SFP Forensics, SFP Property, SFP Datastore and SFP Restructuring Limited. They all joined forces for their very first charity event. The UnTOUCHables was headed up by Edirisa UK’s trustee SIMON CARTER who is a director of Touch Financial. We would like to say a HUGE “THANK YOU” to all the team who helped to raise in excess of £2,000 for our projects. That’s Simon, second from the right, with what looks like a walking stick! Great fun was had by all and they must have made a real spectacle on the Isle of Dogs! All the suited financial types must have wondered what on earth was going on. The challenge now is what to do next year! Edirisa’s Circle of Friends is an initiative created to enhance nursery children’s knowledge of different cultures and create friendships with children from different parts of the world. 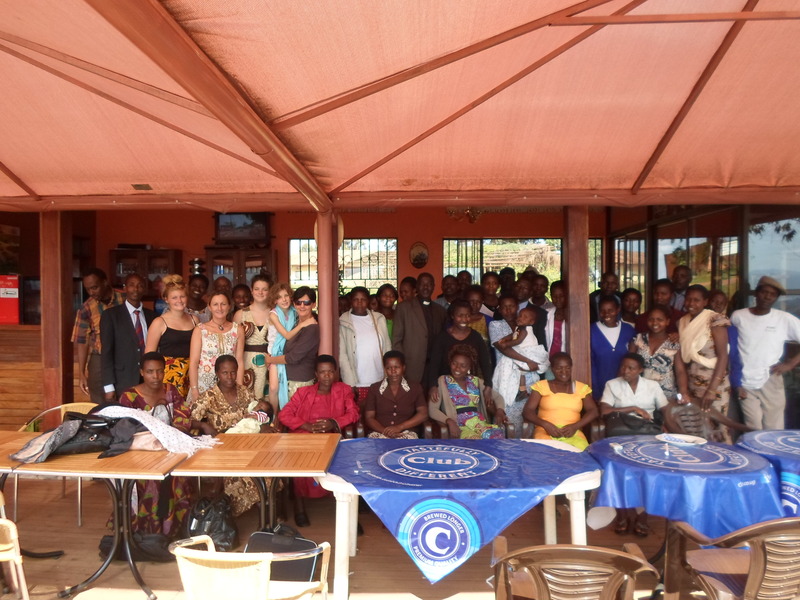 On Saturday 13th July in Kabale, Uganda, we held our first workshop day with the Ugandan members of our Circle of Friends. Two or three representatives from each nursery school attended, travelling from as far away as Mbale and Ntungamo, as much as 12 hours away by bus. Our Operations Manager, Alma Burciaga, led the workshop, ably supported by our Nursery Co-Ordinator, Ashaba Phionah. Mugayehwenki Richard,the local Education Officer, was very impressed with our work with the nurseries on child-centred teaching methods. The day started with each member introducing themselves and participating in an “ice breaker” – this involved blindfolds, tasting and trying to describe different “Muzungu” (western) sweets. Liquorice wasn’t very popular and strawberry “starburst” proved the winner! The morning continued with the following sessions: What is the Circle of Friends? ; Child-centred teaching methods; Circle of Friends as a learning tool; Scrapbooks and how to use them in the classroom. After a hearty Ugandan lunch we covered the topics: How to share with your partner school; nursery projects; members opinions on the Circle of Friends; the way forward. The day was a huge success with everyone getting to know each other, learning new things and enjoying themselves. 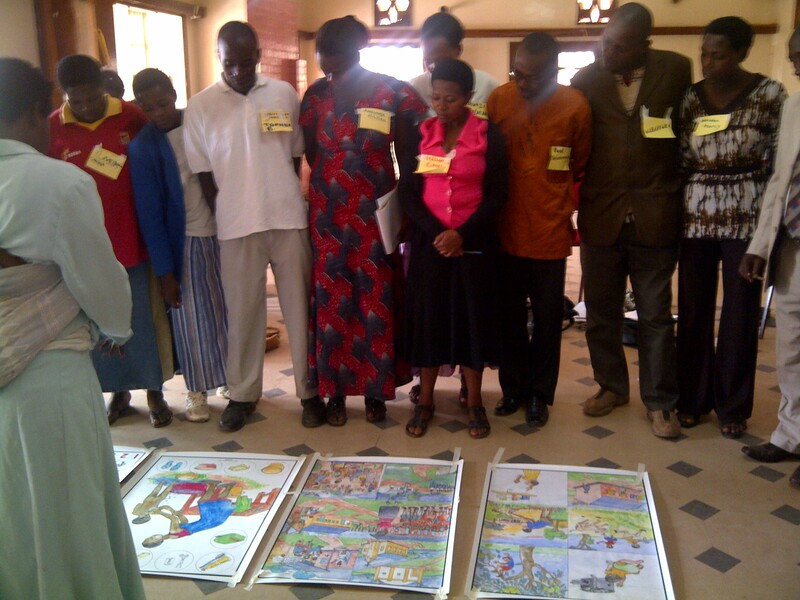 Teachers learned how to use different teaching aids and media to stimulate children’s imagination and creativity. In the Edirisa-run nursery schools we are implementing the Learning Framework for Early Education issued by the Ugandan Government. This document provides basic guidance on how to work with children in 5 major areas, these being: maths; knowing my environment; language and creativity; taking care of myself; and relationship with others. Several of the nursery schools in the Circle had not heard of this framework and were able to obtain copies from Richard. Next term we hope to host some of our members at our nursery schools in Bukinda for some classroom training. Our nursery schools have just benefited from a delivery of picture books that were donated by kids from the Blackheath Bluecoat Church of England School in London – the school Rio Ferdinand attended! Edirisa UK has partnered with Pelican Post – a charity that allows people to make a direct contribution to stimulating a culture of reading in an African school by sending books. 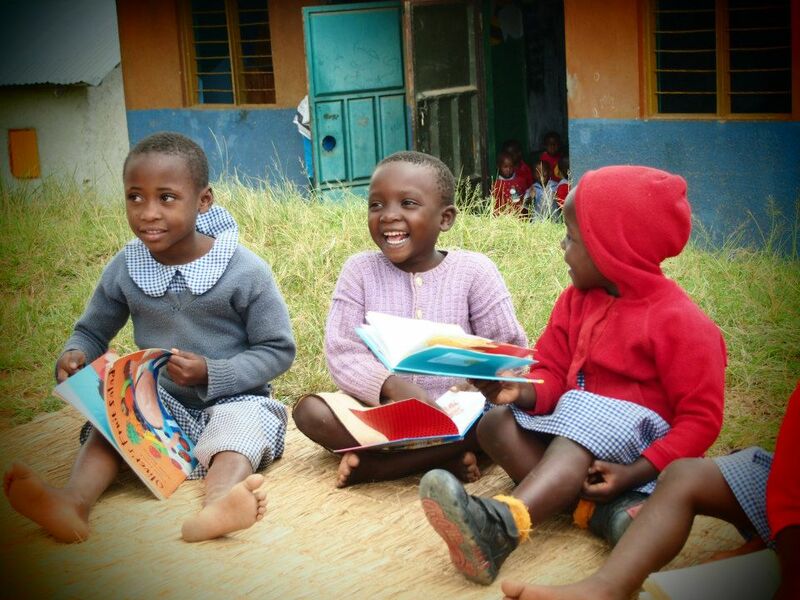 Books educate and inspire young minds, but throughout schools in Africa, books are in critical short supply. In particular, picture books and early learning story books are unheard of in many schools. The books are all in English but are culturally appropriate for African children. The nursery children have received beautifully illustrated story books like – ”We’re going on a Lion Hunt”, “Mama Panye’s Pancakes”, “Handa’s Surprise”. We would like to say a big THANK YOU to the children and staff at Blackheath Bluecoat School and Pelican Post for enriching our children’s lives! Operation Success and a New Life for Rita! Young Rita and her family are very grateful to our ex Operations Manager, Rebecca Swan, who fundraised and organised Rita’s life saving heart operation in Egypt! Rita is now on her way home to Uganda but last week Rebecca visited her at the Aswan Heart Centre. “I visited Rita in Aswan to see how she was getting on after her operation. It was one of the most joyful and inspiring trips of my life. It has been a crazy few months and there were some awful moments when we worried it might not happen at all. On February 17th Rita left Uganda with her aunt, Linate headed for Aswan Health Centre in Egypt. A week later Sir Magdi Yacoub performed the surgery and he was able to repair, rather than replace the damaged valves, meaning that Rita will not need life-long anti-coagulation medication as expected. As Chain of Hope had covered the cost of the flights some of the funds we raised were spent on a monitoring machine for Kabale Hospital. I visited Rita a week later. It was completely awe-inspiring. The hospital is purpose-built and Chain of Hope brings children from all over Africa to receive surgery there. All the swelling of Rita’s face had gone down and her confidence was already improving; she was actually asking me to take photos of her. It was so wonderful to behold and I was completely overcome with gratitude for all the people who made it happen. I’m not usually overly emotional, and can be quite a cynic at times, but seeing Rita walking around her room, smiling and posing for the camera made my heart swell. Well done Rebecca and HUGE thanks to Chain of Hope and all at the Aswan Heart Centre. We wish Rita continuing good health and all at Edirisa look forward to welcoming her back to Bufuka. “Since I volunteered for Edirisa in 2009 to film a short documentary about crafts makers, my life has been haunted by an idea: documenting the story of Akampene. Akampene is a tiny island on Lake Bunyonyi in South-West Uganda where un-married, pregnant young women were abandoned by their fathers/brothers and left to die in an attempt to shun the shame they brought to their family. What struck me immediately was that nobody had tried to research the story before. The only further information I gleaned from the older members of the local Bunyonyi community was that on occasion poor men, unable to afford to ‘buy’ a wife, would pick up one that had been left on Akampene island. So, I decided to document the whole story. Two years ago I convinced a camera operator to invest his time, and his equipment, in the crazy mission of finding survivors. Next, I wrote the script, which I developed in Nairobi thanks to a program run by European Media, and I spent a year looking for funds. The market is tough and no broadcaster or documentary foundation will come on board if they don’t see a rough cut. So last year we started another crazy adventure, crowd funding on the web (http://www.ulule.com/punishmentisland). In the end we managed to raise over €10.000 for the filming thanks to the generosity of our supporters. In February this year we finally went to Lake Bunyonyi with an International crew plus two wonderful local translators. It was tough, from many points of view. Our first and greatest challenge was finding the women who had been left to die on Akampene Island. But find them we did. Then came the next challenge, convincing them to share the story. As it happened this was easier than I had anticipated! As the women listened to each other it was clear they found it easier to share their own experiences. And so the next step is to edit a rough cut and present it to all broadcasters and foundations that expressed interest. We wish Laura every success and look forward to seeing the documentary. “Punishment Island” is not Laura’s first documentary. As she mentioned in her account above, she worked with Edirisa on a Craft Documentary. In September 2012 a viewing was held in one of Edirisa UK’s nursery classrooms and the craft women involved travelled from all around Lake Bunyonyi to view Laura’s finished work. This was the first time most of them had ever seen themselves on film!